No matter how often we stress the importance of winter tires, I still hear people saying that they feel better with a all- or four-wheel drive car when conditions get icy and snowy. Then they run around and tell their clueless friends this, too! So I will continue to write about the benefits of winter tires until I have everyone convinced. Tyre Reviews is back with another video, this time detailing the stark differences between running around in the snow with a car with AWD (they call it 4WD here, but it’s actually AWD for this BMW, though that doesn’t change much) and summer tires and a car with front-wheel drive and winter tires. The team put the cars through acceleration and braking tests, obstacle avoidance, hill starts and stops and handling. The results were pretty much what you’d expect. The AWD car couldn’t get traction off the line, but once it did, it took much longer for it to brake to a stop from about 30 mph. On a 10 percent incline, it struggled to climb, spinning out its tires. Down the same incline, the long braking distance was troubling. It did not manage to clear the obstacle in the road and then proceeded to tank-slap all the way down the course as it struggled to get back into its lane. And it crashed during the lap to determine handling. 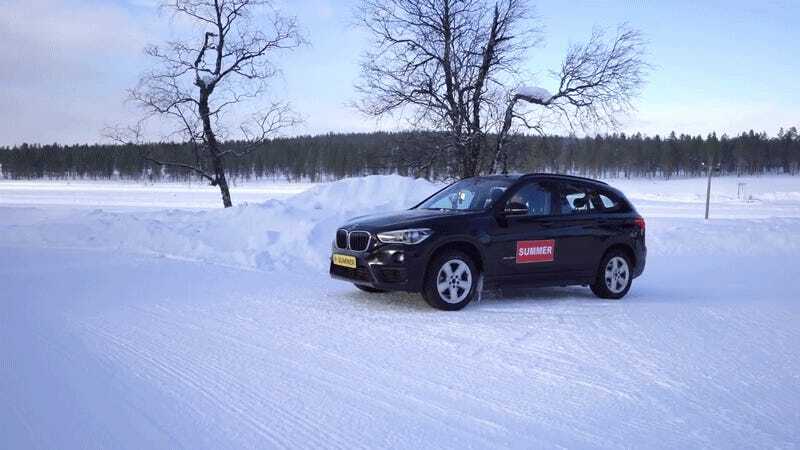 The FWD car, on the other hand, performed all the tests beautifully, proving that winter tires, even on a non-four-wheel drive car, are absolutely vital when faced with slick conditions. Of course, you could argue that you don’t need winter tires through the entire season. Maybe you live in a place that’s really great at plowing its streets. Maybe it doesn’t snow that much. But for the days, even if there is only one of them, where it snows heavily and you just have to get to work, those winter tires could save you. Besides, a set of winter tires is cheaper than buying a car with AWD or 4WD, if you’re in the market. Anyway, have a look at the video.